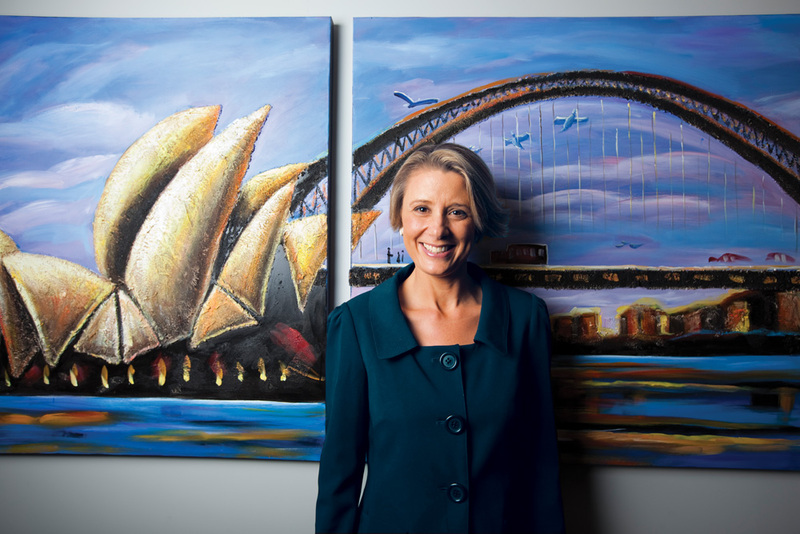 Time Out Sydney interviewed New South Wales Premier Kristina Keneally in the most recent issue, which is accompanied by a photo i did with her. It was a bit chaotic coming together. Prior to the shoot i was told we’d have to do the photo in her office. Pretty boring, but at least i could bring in a backdrop, studio lights, etc… Then a couple of days before the shoot they asked if we could move it to Sydney Opera House. Even better i thought so I started planning for that. Then the morning of the shoot about an hour before it was due to start i got a call saying the shoot had to move to the Botanic Gardens. Not as impressive a backdrop, but should still work nicely. Because everything was changing so quickly, and i knew i’d have very little set-up time, i dumped the idea of studio lights and backdrops, and just went with my Canon Speedlites and Pocketwizards. Also along for the ride was Roxy, Time Out’s designer, who held the speedlite in a softbox. So we arrive at the Botanic Gardens before the Premier, i suss out some good backdrops, do some tests, meet the Premier’s minder and everything seems to be going to plan. The Premier is running late though. Her minder then gets a call and tells me the shoot has to move to her office. I mildly grumble but just get the response, “Welcome to my life”. So we walk several blocks up to the Premier’s nondescript office. It’s very bland. I’m told it’s because politicians get raked over the coals if they appear to waste public money on expensive office fit outs. So we just go for a couple of simple set-ups in front of some artwork around the office. Lit by my Speedlite, held by Roxy into a softbox. All done in about 10 minutes. After all the drama I really like the “Sydney harbour background. Possibly better than the real thing would have been as a backdrop – it makes her a bit more approachable. Nice work Dan, I also really like how the designer incorporated that shot with the layout. Great layout, agree with Ryan on that. Great shoes, too. Can she click her heels together and be anywhere else in a moment? Would be a good trick for a polly to have. great resault Dan, leave it to you to make somthing out of all that chaos, I know what it’s like but my results never come up so pollished. Oscar – with the outfit, i think perhaps the lighting and white balance must’ve made it look a little different. Good work despite all the messing around. I’m experiencing the same thing at the moment, but you have really inspired me to just go with it rather than against it, Thanks! You’ve got to roll with the punches as they say. Hard as it is to not get stressed out and stumped, you’ve got to keep thinking quick and troubleshooting.